Updated Friday February 9, 2018 by Randy Vogt, Director of Public Relations, Eastern New York Youth Soccer Association . November 4, 2015-If you build it, they will come. And come they have for the past four decades to the Waverly Avenue Soccer Complex in Holtsville, whose 15 fields of dreams make up the largest soccer complex on Long Island. The fields are east of the Waverly Avenue School and a short corner kick from Exit 62 of the Long Island Expressway. For decades, Long Islanders have been seeing thousands of kids playing there as they pass on the LIE. Wearing the gold, black and white colors of the non-profit Sachem Youth Soccer League(SYSL), the kids resemble a swarm of bumblebees chasing a soccer ball. Generations of soccer players have called the Waverly Avenue Soccer Complex home and Sachem’s travel teams play in two other non-profit organizations, the Long Island Junior Soccer League (LIJSL) and Eastern New York Youth Soccer Association (ENYYSA). The Waverly Avenue Soccer Complex was built in 1976, just a few years after the LIE expanded to central and eastern Suffolk County. The Keibel farming family donated their large sod farm to the Sachem School District with the express intent of it being only used by the school district or community. The fields were built by volunteers led by Frank Schmidt, Sachem High School boys varsity coach at the time and a longtime soccer volunteer who was inducted into the LIJSL Hall of Fame earlier this year, and Jesse Stancorone, his trusty sidekick who became the first President of SYSL. “School janitors hammered the wooden goalposts into the ground when the fields were built,” Schmidt commented, “The fields are so good, especially the drainage, partly because they were sod farms originally.” It costs SYSL $65,000 annually today to maintain these fields of dreams in addition to the $90,000 irrigation system that SYSL installed. When the first games ever kicked off at the Waverly Avenue Soccer Complex, the kids played under the banner of the Sachem Athletic Club for one year before the SYSL was created in 1977. With the largest soccer complex on Long Island in its backyard, registration took off, increasing exponentially from 200 in the mid-1970s to 1,800 a decade later, which is the same number of Sachem’s registered players in 2015. In addition to travel team and intramural players, the SYSL’s TOPSoccer Special Children have also called the Waverly Avenue Soccer Complex home for decades. 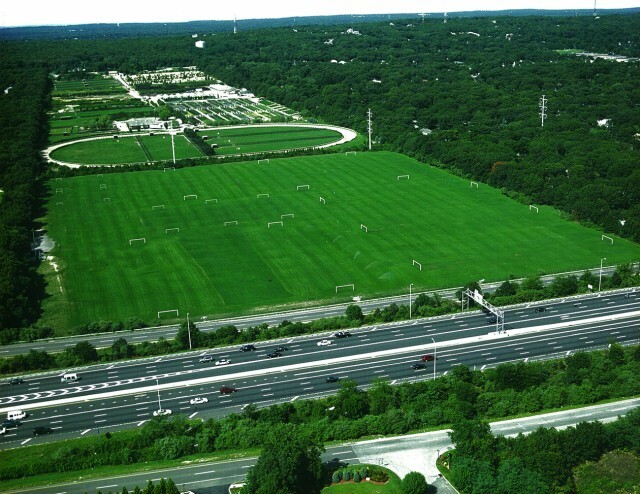 The fields have also hosted tournaments as well as teams who travelled from overseas and were happy to play on some of the best fields on Long Island.